Reprinted from the Pacific Daily News at this link. Guam's own Tatianna Sablan brought home the gold medal from the recent Asian Volleyball Confederation Continental Cup in Mainly Australia with partner Kendra Byrd and yesterday, she continued her success on the beach, this time winning the women's division of the 23rd annual Marianas Cup Festival at the park at Ypao Beach. Sablan teamed up with Anna Vidal from Spain to go undefeated throughout the playoffs and win the title on her third try at the Festival 21-18 against professional volleyball players Nozomi Yanagi and Anna Miyakawa from Japan. The win was a fitting parting gift for Vidal who will be departing Guam back to Spain today after a slew of coaching stints and clinics in our region. "It is the perfect gift, for me. I'm happy," said Vidal after the victory. "This is my first time." "This is always where I've wanted to be," Sablan said pointing to center court. "It's perfect winning this tournament and I'm just so glad that it was with (Anna)." Sablan and Vidal gave credit to their consistent play throughout the tournament and to the advantage of coming from the winner's bracket and not having to play any extra games before the final. "I think they were tired, because they came up from the loser's bracket," said Vidal. "We played our fifth game in the finals, but for them it was probably their seventh game. But I like how they play, (Anna) is really fast and plays tough." The duo had to make a choice when they first faced the Japanese team during pool play, but when they met in the finals, Sablan/Vidal already had a game plan. "We knew them (in the championship match) because we already played them, but we didn't see them play the entire tournament before that," said Sablan. "The first time we played them, we decided to just pick one and then if we were successful, we would stick with it and if not, then we would adjust and pick on the other player." After building an early lead, Sablan/Vidal had to fight from behind to take the advantage later into the match and led 18-15 after an ace by Vidal down the line. Yanagi/Miyakawa called a timeout to put pressure on the server. The strategy worked as a service error gave them the service advantage. Yanagi chose to serve Sablan who sent a perfect pass to Vidal and received a set up the middle, which she tapped a looping shot to deep center and out of reach of either of her opponents for a 19-17 advantage and just two points from the title. After a free ball returned by Yanagi/Miyakawa, Vidal went up high on a tight Sablan set after a phenomenal save and cut a sharp shot that rolled the length of the net and dropped just inside the line for match point. Miyakawa returned the favor, hitting off of Vidal's block to give her team some hope at 20-18, but it was just a delay of the inevitable as Vidal ended all thoughts of a comeback with a short angle shot over Yanagi's block and into the corner for the victory. Coming in third place were the team of Kendra Byrd and Erika Habaguchi. The team of Tyler Willsey and Tsuchiya Takashi came away with the championship with a 21-19 hard-fought victory against Russ Quinn and Kosuke Sato. Willsey/Takashi had the advantage of coming from the winners' bracket where they waited for Quinn/Sato to advance. Willsey and Quinn are actual teammates from Saipan who were paired with Japanese professionals Takashi and Sato for the tournament, and ended up facing each other in the championship match. Quinn/Sato advanced to the finals after they defeated Jeff Carlucci and Brandon Chance 8-4 due to a forfeit injury. Carlucci/Chance finished third. Northern Mariana Islands Volleyball Association (NMIVA) is pleased to announce a new indoor volleyball program kicking off this week! In an effort to increase our youth players’ exposure, NMI Volleyball is initiating an All‐Star High School Team program. Initially we will begin with one male team and one female team consisting of 30 players each. Not all players will necessarily be selected to attend or play in competitions. This privilege will be earned through hard work, dedication and commitment to the program. The All Stars teams will be selected from players who participated in the Marianas Interscholastic Sports Organization (MISO) league's most recent seasons (SY2014-15). Total number of players will be about 60-players. The recent MISO season champion teams will automatically be included and then MISO players will be recruited via nomination by their MISO coaches from each and every other team in the league. Fundamentally, NMIVA has worked with MISO for the past few years helping with its high school league program, which is inclusive of public and private schools. This program has steadily produced better and better players each season; as such it was recognized that the community was ready for next steps. MISO and NMIVA looked at it and identified two objectives. First, expand to junior high school and second create next tier competition opportunities. "We think that after this pilot season, we should have a better sense of the base of players that we have to work with and develop over the next 3-4 years. In a long-term vision, these players would either be heading to college with amazing volleyball skills or else continuing to represent a CNMI National Volleyball Team," offered Nick Gross, MISO director. 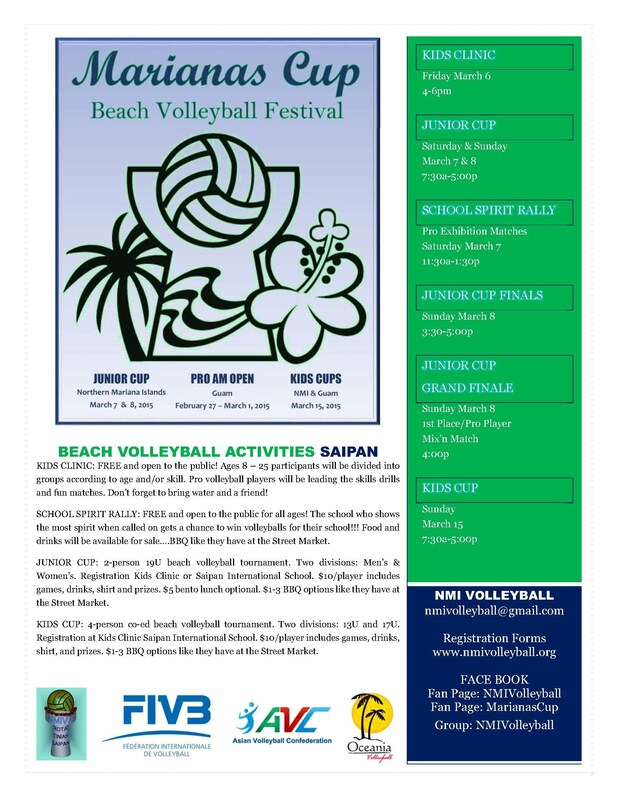 Guam Volleyball Federation has invited the NMI Volleyball Association to enter teams in their high school championship tournament. The boys’ tournament will be May 29‐June 1, 2015 and the girls’ tournament will be in October (exact date to be determined), 2015. These will be the first competitions that the All-Stars teams will target. "We've had to look at the fact that our limited resources need to support the greatest return for the total growth of our sport. We are seeing our initial target population for off island competition is likely those 14-25 ages looking out over the next 5-10 years," said Laurie Peterka, president for NMIVA. "We've wanted to expand these opportunities for some time now, but we lacked volunteers or resources to help make additional programs possible. Now that we have Darcy and Codie to help Nick and I, we can push forward on our dreams of seeing competitive indoor continue both here and regionally; and eventually internationally. We have to take baby steps and build our capacity so that we have strong programs, dedicated players and a good shot at competing successfully in the regional and international arenas," said Peterka. Peterka further commented, "For resource support, we are applying to the Oceania Zonal Volleyball Association (OZVA) and Asian Volleyball Confederation (AVC). 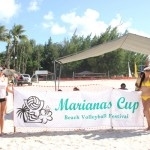 We've also reached out to USA Volleyball, who helped by donating volleyballs and training videos." Darcy Wylie is a CNMI Public School System (PSS) school teacher who recently moved to Saipan from south Florida. She is a former volleyball player and a coach as well as an avid softball player. Darcy loves coaching and loves working with the youth. "I believe strongly in passion, dedication, sportsmanship and hustle," said Wylie. "I believe that hustle (synonymous with effort) is the foundation of a good team. Many shortcomings in the areas of skills and ability can be overcome with hustle and effort," Wylie explained. Wylie coached the MHS boys in their SY2014-15 season. She is currently working on developing opportunities to expand volleyball at the elementary level and quite willingly took up the lead role on helping to create the NMIVA All Stars program. Wylie additionally volunteered to become a board member for NMI Volleyball as of last November. Codie Sayles is a respiratory therapist at Commonwealth Health Care Corporation (CHC). She grew up playing volleyball, was on varsity all four years of high school and played two years at a community college in Northern California. After college she coached girls 16-18 traveling club volleyball team for 5 years. "I love coaching and can't wait to help with organizing and training the All Stars nominees and any other way that I can help with volleyball while I am here," said Sayles. "It's very exciting to see all the dots connecting and people stepping forward to help push NMI Volleyball to the next plateau!" stated Peterka and continued, "Sometimes its hard to be patient. There is this giant thing that has so many possibilities but we have to prioritize based on a grand vision and then have faith that all of the pieces will come together...again and again and again! I have the greatest confidence in the group who have taken on the next steps for expanding indoor volleyball programs in the NMI and will provide as much foundational support as I can." MISO coaches have been notified via email and asked to return their nomination forms. After receiving the nominations, NMIVA will contact the student athletes to inform them of their nomination, and schedule a players’ meeting. At that meeting, we will discuss player expectations, commitment, and responsibilities. Nomination deadline is February 28th, 2015.